It’s no secret that your body is guaranteed to go through some major changes during pregnancy. Your hair can be affected as well. Because of the erratic nature of hormonal changes during pregnancy, your hair can become frizzy and unruly. Your hair may also become oily or really dry depending on your body or hormones. During those long days carrying the baby, the last thing you want to feel is unkempt with frizzy or dry locks. The list goes on and on about beauty product ingredients you should avoid while pregnant. Who has time to read every product label to find out if it contains something that may be harmful to your developing baby? Here’s a step-by-step guide for using ingredients from around the house to create your own hair treatments while also avoiding chemicals that may be harmful to your baby. This may be the simplest treatment for dry hair that can be used any time before, during and after shampooing hair. Take two to three drops of rose hip oil, massage into your scalp and apply to the ends of your hair for lightweight moisture. This treatment is safe for daily usage. 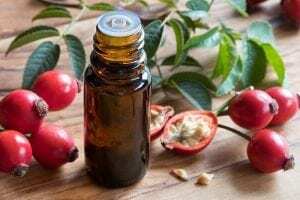 Rose hip oil is hypoallergenic and works for skin as well as nails, and it is both safe and effective for obtaining luxurious and shiny locks. Using lemon will make your hair shiny and supple and get the necessary moisture. This hair conditioner is extremely simple: mix the juice of one lemon with three teaspoons of soybean oil and four tablespoons of cream. After washing your hair, apply to damp hair and let it soak for about ten minutes. Then rinse out with a shampoo. Avocado is a potent moisturizer and frizz-control agent when applied to hair. This hair treatment can be used every two weeks to smooth and control unruly hair. 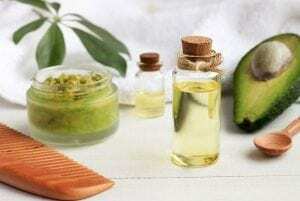 Mash half an avocado in a bowl and apply to clean, towel-dried hair. Remember to pull this hair treatment all the way to the ends of your hair. Allow it to sit for 15 to 20 minutes before rinsing. Avocado is known to have natural fats that are highly effective in nourishing and strengthening hair while smoothing the hair cuticles. Add banana to the mixture for extra shine! Oily hair in pregnancy is directly related to hormones that cause extra secretions from sweat glands to sit on the scalp and hair shaft. If your hair is excessively oily, grab some apple cider vinegar to rinse your hair after shampooing. Use three tablespoons in one cup of water. Rinse hair with the solution and leave on for three to five minutes, then rinse. It is well-known for its clarifying and exfoliating effects on the scalp and hair to reveal voluminous and lightweight locks. It is also known for its benefits for toning skin and reducing acne breakouts. Using these all-natural hair treatments, you can be sure that you still feel beautiful while protecting your baby from exposure to harsh chemicals found in many products on the market. You are sure to feel beautiful as your growing belly and pregnancy glow start to show.